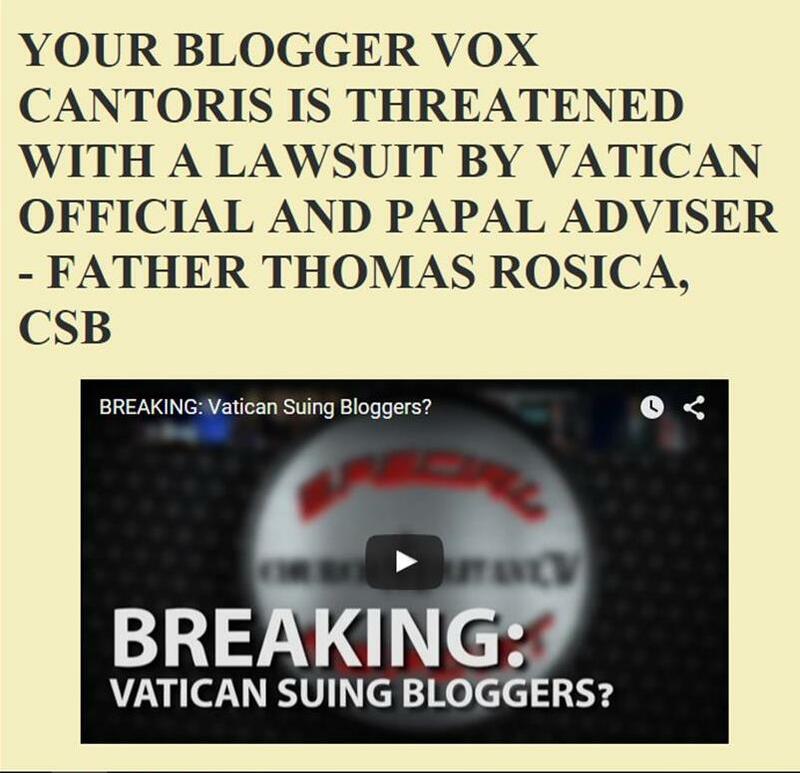 Vox Cantoris: Bishop of Rome - "It doesn't matter" which religion you follow! What is the context? Bishop of Rome - "It doesn't matter" which religion you follow! What is the context? Look, these are the things that come to my mind. How to do this? Simply in the awareness that we all have something in common, we’re all human. And in this humanity, we can get close to each other to work together … “But I belong to this religion, or to that one …” it doesn’t matter! Let’s all go forward to work together, respecting each other, respecting! I see this miracle: the miracle of a desert that becomes a forest. "Therefore go and make disciples of all nations, baptising them in the name of the Father and of the Son and of the Holy Spirit." That Divine Commission means that all people on earth are to be baptised as Christians and received into the One, Holy, Catholic and Apostolic Church. That is the command of Jesus. Some questions have arisen about the "context" on a Facebook post of this blog and by my good friend, Mark, in the combox. The preceding paragraphs refer to forgiveness and building up. Those are the things that come to his "mind" when he makes the next statement. He theorised about a fictitious person saying that they belong to "this religion, or to that one," but he then says, "it doesn't matter." He says, "Let’s all go forward to work together, respecting each other, respecting! I see this miracle: the miracle of a desert that becomes a forest. Thanks for everything you do!" It actually confirms the hypothetical "it doesn't matter" which religion as being fine as long as there is this "respect." He was referring to a hypothetical situation, but his answer to it is to leave people in whatever religion. As long as we all get along that is just fine. This is not the Christian Gospel! In daily life, I must "respect" others whom I work and interact with, this is the basis of a civil society, but the Vicar of Christ must preach CHRIST, not polite social interaction for secular achievement! With that quote, (originating at the NCReporter) Father Thomas J. Rosica, on numerous occasions, laid out the plan of the Synods on the Family and the Apostolic Exhortation of Pope Francis. Christ has won the war. I just read the article in question on Crux and the context of Pope Francis' "religion...it doesn't matter" is very obvious. Pope Francis was talking about social interaction and helping people. He is 100 percent correct in what he said. 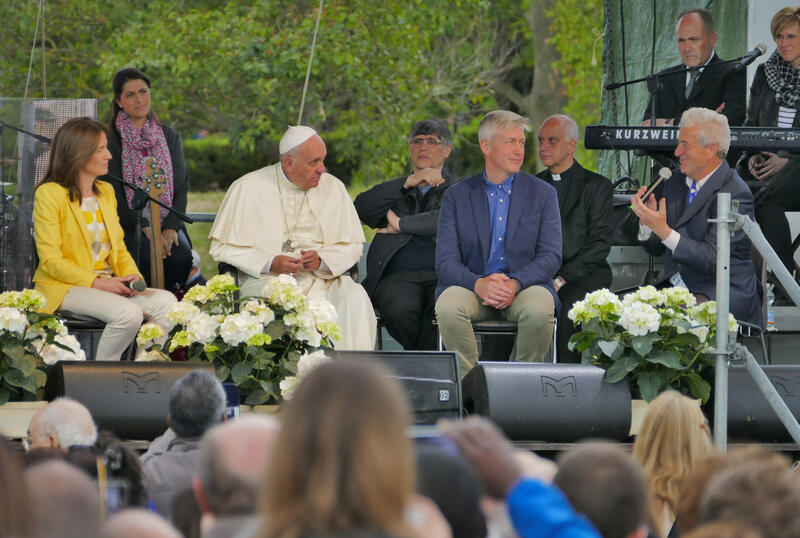 In the sentences leading to the quotation in question, Pope Francis noted that today "at the center of the world is the god of money..." He then noted that there are people who are "in hunger, in illness, in exploitation … Think about the exploitation of children, of young people." He then talked about helping people to make this world, which he described as a "desert" to "become a forest...and forgive, because with forgiveness, regret and resentment fall away. Then, always “construct,” not destroy, construct..."
Then he noted that people wish to work for a better world but say that "I belong to this religion, or to that one …” it doesn’t matter!" "Let’s all go forward to work together, respecting each other, respecting!" That is all that the Holy Father meant by his remark, which is 100 percent correct. We shouldn't refuse to help this person or that person, or refuse to forgive people based upon the notion that "I belong to this religion, or to that one …” it doesn’t matter!" I would be amazed that if this non-story gains traction even among traditionalists. There isn't anything to it. I also find myself thinking about sedevacantism. What is happening in our church and why? I thought our pope witnessed an Eucharistic miracle in Buenos Aires? Of course it matters. There's only one truth. Dan, i just want to hear him announce the Consecration of Russia to the Immaculate Heart. No one can go to the father except through Me .he who denies Me before men ,I will deny before My Heavenly Father.So it does not matter what religion you belong to according to Pope Francis ,it obviously matters to God .to say it does not matter what religion you belong to ,is to deny Christ and contradict the Word of God. Saint Paul said: “But though we, or an angel from heaven, preach a gospel to you besides that which we have preached to you, let him be anathema. As we said before, so now I say again: If any one preach to you a gospel, besides that which you have received, let him be anathema” (Gal 1:8-9)". Not to worry, St. Paul must be retrogressive and out of date. Francis is only practicing what Vatican II teaches - the "Church of Christ" is not the same as the Roman Catholic Church. The Church of Christ is partially, or fully present in any religion according to how many "elements" of the Truth each religion has; to have all the elements like the Catholic Church is best, but to have just some elements is also good enough to get to Heaven. In Nostra Aetate, we read: "Thus in Hinduism, men contemplate the divine mystery and express it through an inexhaustible abundance of myths and through searching philosophical inquiry. They seek freedom from the anguish of our human condition either through ascetical practices or profound meditation or a flight to God with love and trust. Again, Buddhism, in its various forms, realizes the radical insufficiency of this changeable world; it teaches a way by which men, in a devout and confident spirit, may be able either to acquire the state of perfect liberation, or attain, by their own efforts or through higher help, supreme illumination. Likewise, other religions found everywhere try to counter the restlessness of the human heart, each in its own manner, by proposing "ways," comprising teachings, rules of life, and sacred rites. The Catholic Church rejects nothing that is true and holy in these religions. She regards with sincere reverence those ways of conduct and of life, those precepts and teachings which, though differing in many aspects from the ones she holds and sets forth, nonetheless often reflect a ray of that Truth which enlightens all men." [Shucks, I really hope St. Paul is not listening]. Psalm 96:5: " For all the gods of the Gentiles are devils: but the Lord made the heavens." 1 Corinthians 10:20: "But the things which the heathens sacrifice, they sacrifice to devils, and not to God. And I would not that you should be made partakers with devils." August 8, 1985: Wotyla prayed with African animists, calling themselves "witch doctors." In L'Osservatore Romano, he stated, "The prayer meeting at Lake Togo was particularly striking. There I prayed for the first time with animists." February 6, 1986: In Chennai, India, he participated in a Zoarastrian ceremony by lighting a candle while wearing a stole with the symbols of the pagan religion. This was the religion of Babylon during the Hebrew captivity. When 25 Jewish priests adored the sun inside the Temple, God considered it an abomination and severely punished the Hebrews for their participation in pagan worship. (See Ez. 8:16). In 1986; 2002, he invited all the false religions of the world to a gathering in Assisi for world peace. Each false religion, including Islam, Buddhism, Hinduism, Shintoism, Zoroastrianism, and Voodoo (among many others) was invited to pray and make sacrifices. A Budda was placed atop the Tabernacle and a statue of Our Lady prohibited from entering the church. October 27, 2011: Ratzinger held yet another such abomination wherein a Voodoo witch, Wande Abimbola, sang a hymn to the [demon] goddess Olokun at the Assisi Basilica of Holy Mary of the Angels. "Now, whoever will carefully examine and reflect upon the condition of the various religious societies, divided among themselves, and separated from the Catholic Church, which, from the days of our Lord Jesus Christ and his Apostles has never ceased to exercise, by its lawful pastors, and still continues to exercise, the divine power committed to it by this same Lord; cannot fail to satisfy himself that neither any one of these societies by itself, nor all of them together, can in any manner constitute and be that One Catholic Church which Christ our Lord built, and established, and willed should continue; and that they cannot in any way be said to be branches or parts of that Church, since they are visibly cut off from Catholic unity." Dear Anonymous @ 8:07 pm, What a spot on comment! Please check out the new book True or False Pope by John Salza and Robert Siscoe at www trueorfalsepope.com. This book is essential reading for every Catholic. My reply to fratello above is also for you. Thank you. Did not one or other real Pope condemn indifferentism? No surprises here. Pope Francis is a One Worlder where there is acceptance of all faiths or no faith. At this stage of his pontificate no one can accuse him of being a Roman Catholic in a pre-Vatican II sense. This is the subtext of most of his messages. To disagree with him is to be a fundamentalist (pre-V2). As a matter of fact, the sentiments enunciated by Franciscus have been widely espoused within Mother Church since Vatican II. How many times have we heard of potential converts been told to remain where they are, we are all one, or words to that effect. The apparent fact that there pervades a belief that we are not "The One True Faith" goes some way to explain the hastening demise of congregations and parishes. Throughout Europe church closures escalate. You should pray that God will allow us a True Holy Pope. Catholics are so blinded by JPII Benedict and Francis. The world loved all 3 immensely.. What does that say loud and clear?? The Novus Ordo is a false sect. I don't think this is as easy to brush away as you suggest. The point remains that the Pope, who's J-O-B it is to always be a representative of Christ, likes to lock Christ in the closet whenever he goes about doing other things. The man is shameless, and scandalously says "It doesn't matter." But for Francis there seems to never be a time when it does matter. And it DOES MATTER! Even his own point can be emphasized and strengthened from a Catholic perspective where stewardship of the environment and care for others is mandated by God the Creator & Christ. What if one belongs to a religion where it's enemies are to be treated with contempt always? Will Francis start telling them how to practice their false faiths? Is he the spokesperson for other religions now? This statement isn't the tip of any iceburg, but it is further evidence to how far away Christ and his duty as the Fisherman is from the mind of Pope Francis. "0" dear me, so Christ died for nothing? according to C Jorge who needs Christ.. The ostriches are saying that it's all ok, coz Pope Bergoglio was just talking secular stuff like saving the environment. But that's exactly the problem. His job is to preach the Gospel and to save souls. Peter Lamb, ah yes, as you make us understand, more than once even. "You should pray that God will allow us a True Holy Pope." Ramm, how about adding "or to discover if we already have one"? I think David Bawden is probably the Pope, having taken the name Michael, though Feeneyites will of course prefer either Boniface X (unknown previous name) or Alejandro IX (Alejandro Greija). If I may steal shamelessly from a Facebook post I just read critical of this article. I agree with this person. Son of Ya'Kov. Your comment makes sense and is a good explanation. Unfortunately, most folks don't hear it that way. Pope Francis should, by now, have learned to be very clear and unambiguous in his statements. But so far he hasn't. Unfortunately, that is not true either, and is likely to make him a candidate for False Prophet and / or Beast. Take an issue like alcohol. Homeless person x has been seen drinking beer with a meal. Is he an alcoholic or not? Obviously, Mohammetans, certain Protestants and AA are likely to stamp him as such regardless of the medical definition of alcoholism and regardless of whether or not he has another kind of consumtion too. And then they are considered as having equal contributions to give to the common good? No. Or Creation science in schools and in homeschooling, and licitness of latter. Obviously atheists of evolutionist fanatic type are likelier to have an outlook which makes them unsuited for working together for the common good. It may be noted that when it came to bettering the conditions of workers, arguably part of the commonn good, Pope St Pius X condemned opposite attitude, the one of Bergoglio. He said Catholic workers were NOT to join unions that were open to Protestants and unbelievers.